Fried rice is such a versatile dish where you can use any types of meats and vegetables to flavour the rice. It is extremely easy to make and quick to serve for hungry friends and family. 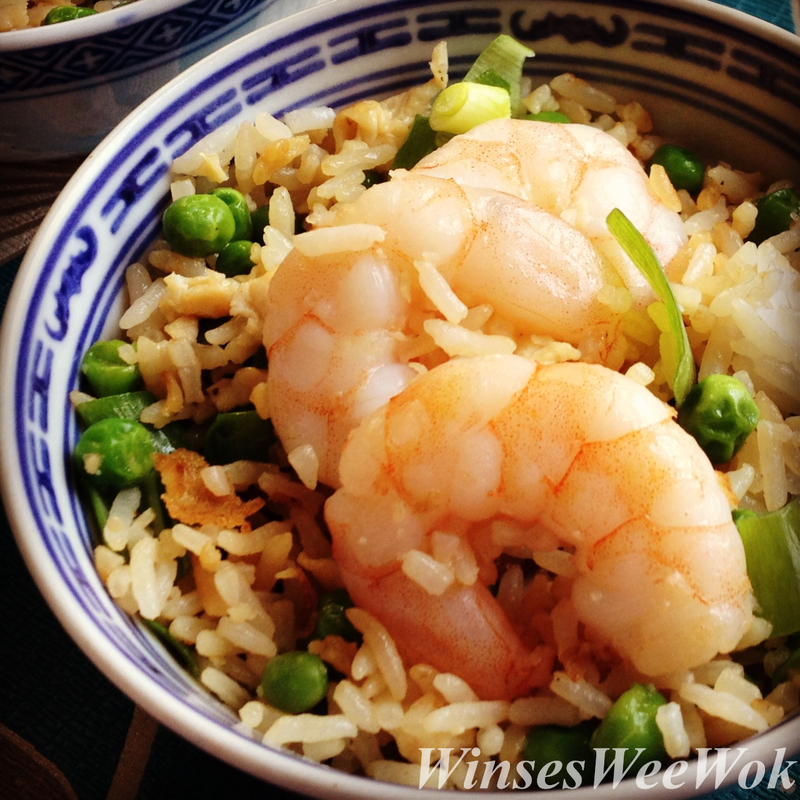 I prefer using king prawns as it sounds luxurious with the juicy king prawns which flavours the rice and the whole kitchen is filled with fragrant aroma from the east. The secret to fluffy rice is to use boiled, overnight, previous day rice. You can either boil the rice the night before or have leftover boiled rice from the previous day. Once cooled store in the fridge for the following day use. You must be thinking why use overnight rice? It`s because freshly made rice contains a lot of moisture which results in a soggy, mushy fried rice dish. Overnight or next day rice has a chance to dry out in the fridge for that perfect fried rice. When you come to cook the rice it will be slightly hydrated from the natural vegetables juices, from the soy and also the sesame oil. A easy and must try dish ..you can really taste the difference! • Wash, shelled and deveined king prawns, coat with pepper and salt, set aside. • Mix the eggs into a bowl, set aside. Wash, chop the spring onions and set aside. • Heat a wok on high heat, swirl a tablespoon and a half of oil into the wok. Once smoking hot, stir-fry the king prawns for 1 ½ minute, scoop out the prawns from the wok leaving the flavoured prawn oil in the wok. • Add the remaining tablespoon of oil, add the beaten eggs into the wok, swirl and stir fry to break it up for 30 seconds. Add the overnight rice, make sure the rice is spread flatly around the surface of the wok to allow the rice to cook quickly and evenly. Leave to cook for 1 ½ minutes and stir fry the rice, mixing the bottom and surface layer rice to the top surface of the wok and again flatten it around the wok. Add frozen peas, mix well and allow to cook for 2-3 minutes. 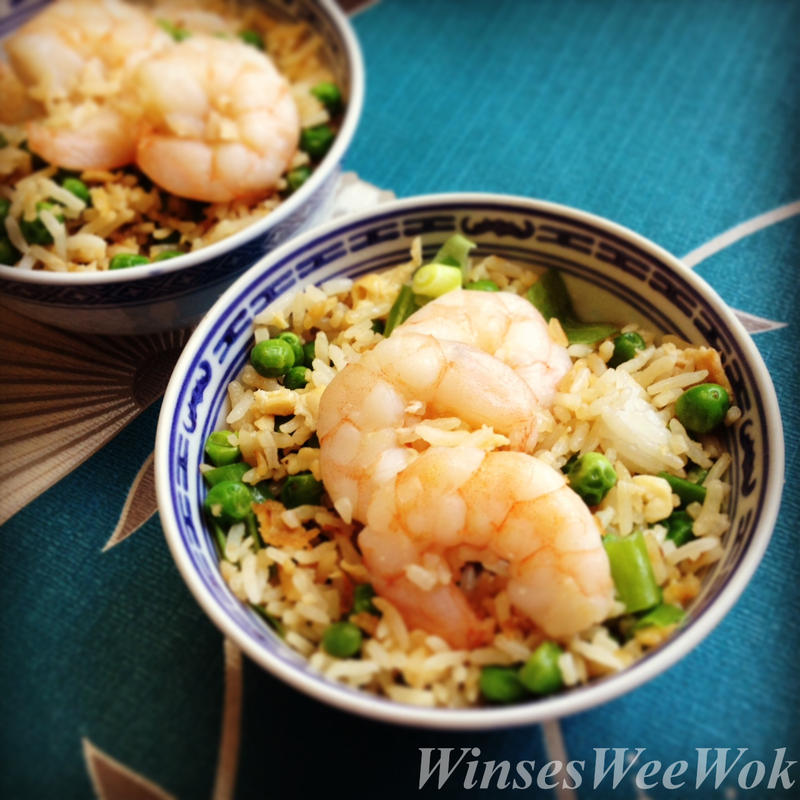 • Scatter the prawns and spring onions over the rice. Stir fry and toss for 10 seconds before adding soy sauce and sesame oil. Stir fry occasionally and allow to cook for 2 minutes. When the rice grains starts to jump from the wok then you know it is ready. Enjoy.